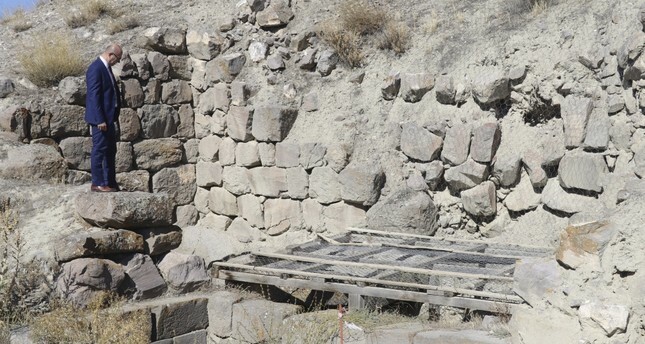 Located on the historic Silk Route and being one of the leading Urartu cities that has survived up until today along with the 2,900-year-old Altıntepe Castle in it, the ancient site in Erzincan province will be transformed into an archaeological park and serve as an open-air museum. Erzincan Provincial Director of Culture and Tourism Arda Heb spoke to Anadolu Agency (AA) and said that located 15 kilometers away from the city center, Altıntepe Castle was built in the time of Urartus on the historic Silk Route. Exposed to so many excavations in the past, the ancient site with the historic castle was excavated between 1959 and 1967 for the first time with the leadership of professor Tahsin Özgüç, who is an academic at Ankara University. With the cooperation of the Ministry of Culture and Tourism and Atatürk University, a new study was started on the castle in 2003 by professor Mehmet Karaosmanoğlu. Speaking on the studies, Heb said, "They came across important findings during excavations. The interior castle door, castle walls and the reception room called 'apadana' in Altıntepe are among them. Archaeologists also detected a warehouse, a sewage system, an open-air temple and three stone-masonry type graves. Dating back to Urartus, the artifacts found in Altıntepe contributed to Anatolian archaeology and were accepted as the leading examples of the culture they represent." The most important characteristic of the excavation site is that it was home to the first example of a toilet bowl. The site also has one of the very earliest sewage systems in history. Stating that various figures made of mosaics and a church were found during the excavations, Heb added, "On the eastern skirt of the castle hill, a church dating back to the East Roman Empire situated on a terrace was found in 2003. What makes the church special is that the mosaic figures seen on its floor survived up until today." Stating that the castle was home to Urartus and Byzantines once, Heb said, "As one of the strongest Urartu cities that survived up until today, Altıntepe is in the books as the tumulus [mound] with the richest historical artifacts in the region." "The archaeopark project we prepared as the governorship of Erzincan and the Provincial Directorate of Culture and Tourism, was verified by the Turkish Ministry of Culture and Tourism and the Erzurum Board of Protection of Cultural and National Heritage. Our project consists of three sections. In the first step, the legs of the king's tombs will be ascended. In the aftermath, joint filters will be evacuated. In the second and the third step of our archaeopark project, on the other hand, we will complete walking trails, viewing terraces and cafeterias to host guests." Built it the time of Urartus, Altıntepe Castle is 15 kilometers away from the Erzincan city center. It is situated on a hill located northeast of the city with a height of almost 60 meters. On the eastern side of the hill, on which the castle - among the leading centers of Eastern Rome - is located, there is a three-nave church covered with mosaics. With its castle walls, reception hall, open-air temple, tombs and sewage system, Altıntepe Castle is home to excavations conducted by Atatürk University's Department of Archaeology.